With “The Real Thing,” playwright Tom Stoppard juxtaposes heartfelt themes of honesty, vulnerability, and commitment against the make-believe world of theatrical emotions. 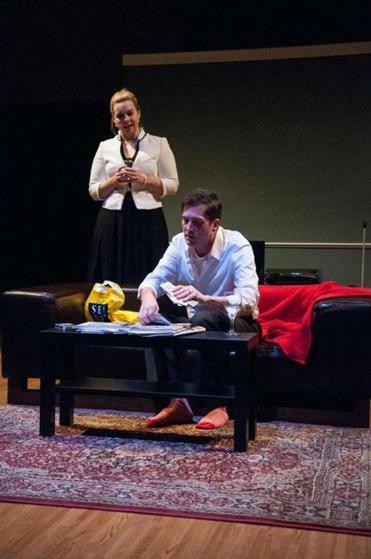 Bad Habit’s sleek production, now playing at Deane Hall in the Calderwood Pavilion, delivers that tension between fake and genuine feeling with an ensemble of performers that are so transparent we begin to believe we are simply eavesdropping on a relationship’s awkward moments. Stoppard’s romantic drama opens with a revelation of marital betrayal that turns out to be a scene from the latest hit play by Henry (Bob Mussett). No sooner has Stoppard established the glib world in which Max (R. Nelson Lacey) uncovers Charlotte’s (Gillian Mackay-Smith) infidelity in a bit of banter right out of Noel Coward, he breaks the spell. It turns out that offstage, Henry the playwright has been cheating on his wife, Charlotte, with Max’s wife, Annie (Courtland Jones). What might have been a simple melodrama evolves into an exploration of Henry’s ability to break through the protective veneer of his clever quips to find and keep “the real thing”: his new relationship with Annie. Annie’s dalliance with a young actor and her interest in an anti-nuclear demonstrator’s playwriting efforts only add to Henry’s challenge. But the messiness of Henry and Annie’s relationship creates the kind of friction Henry needs to shift from facile wordsmith to a vulnerable human being, determined to recommit himself to Annie every day. Because this is Stoppard, author of such dramatically and intellectually daring plays as “Arcadia,” “Coast of Utopia,” and “Rosencrantz and Guildenstern Are Dead,” among others, we are treated to arguments about taste — the Righteous Brothers versus Maria Callas — and references to lions of the literary canon, from John Ford to August Strindberg. As Henry, Mussett offers a man who relishes his intellectual superiority and then slowly allows us to watch as he peels away that mask to expose a man determined to work at love and marriage. Director A. Nora Long finds lots of subtleties in a play that can overwhelm its audience with Stoppard’s intellectual gymnastics, even using scene changes as an opportunity to re-orient us into the pathos of a scene. While Stoppard’s subplot about a goofy anti-nuclear activist who is also a fledgling playwright feels like a too-easy target, Mussett delivers Stoppard’s defense of good writing (a glorious speech that likens the power of a writer’s word to that of a cricket bat) with an affecting simplicity. Mussett gets terrific support from Mackay-Smith as his smug ex-wife; Jones as the complicated Annie; Lacey as the oblivious Max; William Bowry as both the swaggering Brodie, the activist, and Billie, the young actor who portrays Brodie; and Shanae Burch as Henry’s teenage daughter Debbie, who sees right through him. Director Long also has a keen sense of the pace of the play, allowing her actors to play fast and loose at first and then slowing things down. We see the “thinking time” in which Henry realizes love is not the unliterary subject he dismissed, but the ultimate bond.